The Media Awards recognize journalists who raise awareness about child sexual exploitation. Submissions are accepted in the categories of Electronic Media, English and French, Print Media, English and French, Integrated Media, English and French, and International Media by a Canadian Journalist. The Beyond Borders ECPAT Canada Media Awards were established in 2003. Must fall within the timeframe of Sept 1 to August 31 of a given year. Produced/published in Canada. The story can take place anywhere in the world but it must be Canadian journalism/filmmaking. Increased awareness – The submission provides the audience with accurate information that highlights the dynamics and realities of sexual exploitation. It may provide new insights or uncover underlying causes of the issue. The coverage may lead to further journalistic investigation of the story or support legislative or policy changes to better address the issue. Quality of work – The submission is well researched and balanced in its approach. It is well written and in the case of broadcast, has high production values. It may use innovative or dramatic techniques that reinforce the message included in the coverage. Respectful – The submission uses respectful language that does not denigrate or cast blame upon those victimized through sexual exploitation. Submissions must meet the ethical guidelines for reporting on children set out by UNICEF. Submissions must represent the issue in a clear and balanced manner that does not sensationalize the abuse of children in any way. 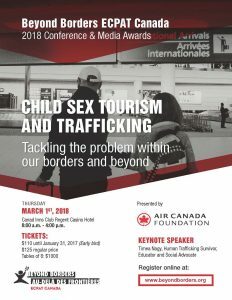 A panel appointed by The Media Awards Committee, an ad hoc Committee established by the Board of Directors of Beyond Borders Inc./Au-delà des frontiers Inc. selects recipients on an annual basis. Meet the panel. All nominations shall be submitted to the Media Awards Committee by October 30th of each year.